A histogram is a display on your camera that shows your exposure - how much of your photograph is shadows, how much is bright, and if any areas are completely black or white. This information is also referred to as the tonal range of a photo. 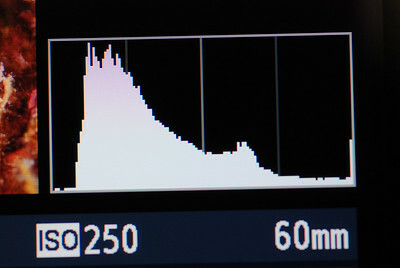 All dSLR's and most compact cameras can show a histogram. Most also can show 3 histograms at once, one for the red, green, and blue channels. All pixels in your photo are actually just combinations of red, green, and blue values, called an RGB value, that ranges from 0-255. Proper exposure is very important. 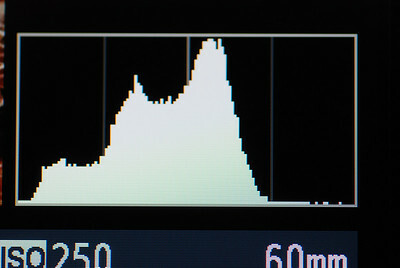 I recommend always having your histogram on display underwater so you can monitor your exposures. An underexposed image will have to be brightened afterwards, which can greatly increase noise. There is much more noise in the in the darker areas of the image than in the brighter areas. Overexposure will result in "clipping", or blown out highlights, which is lost data permanently set to the brightest pixel levels. Shooting in RAW will give you a couple extra stops of highlight data that can be recovered in the raw editor, so you can overexposure slightly more when shooting raw, but at some point highlights will still be permanently lost. 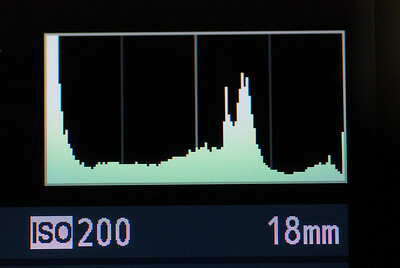 Viewing your histogram underwater while taking photos is important. Learn how to get your histogram to show up next to your photo after taking each shot. Histograms can be viewed as a single histogram, or as 3 histograms for red, green, and blue. I usually just view the single histogram unless I am checking to see if my strobes are properly firing, in which case I will want to make sure the red histogram is strong. 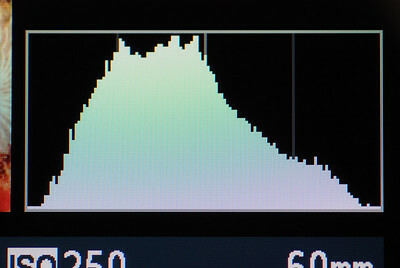 The left side of a histogram represents shadows, the mid-section mid-tones, and the right side highlights. You want to avoid "clipping" unless you are intentionally introducing very bright or dark areas into your photograph. Clipped data is lost data in a JPEG, and somewhat recoverable in a RAW file to a small extent. Shadow data lightened to bring it up to a proper exposure can show considerable noise, which is why its important to get exposure correct in the camera. A slight overexposure can be ok, as long as you are not blowing out highlights unintentionally. When shooting JPEG, and data to the right of the histogram is not recoverable, and is recorded as pure white. When shooting raw, you can usually recover one or two extra stops of data. To recover blown highlights in just one color channel (the red channel always seems the one to overexpose), use the luminance/hue/saturation slide in your raw editor. 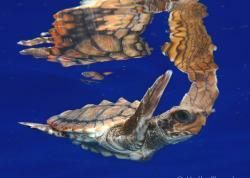 Choose luminance, and slide the red slider to the left. What is a correct histogram? There is rarely a "correct" histogram, it is up to you how you want to portray an image. Use the histogram as a tool to tell you how the image was captured. If the histogram is showing you significant dark, bright, or blown out areas, make sure that is what you wanted. Evenly distributed exposure. Notice 2 things about this histogram. 1) Follow the bottom of the histogram from left to right. The data reaches all the way to the left and the right. this means the full spectrum from 0 to 255 (pure black to pure white) is utilized. High contrast photo. Again, the full spectrum is used. If you look to the left, you'll see significant dark shadow areas. All the way to the right, along the right edge, you will notice a line that rises up one third of the way. This represents blown highlights. This photo has a greater dynamic range then can be recorded in your jpeg file. If you are shooting in RAW, some of this may be able to be recovered. Exposure with a "black background." This photo was of a bright nudibranch. Notice that most of the photo is quite dark, but the full spectrum is used, the data along the bottom reaches all the way to the right, without any blown highlights. Exposure with some "hot spots." 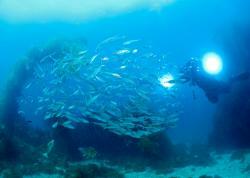 This photo has some white coral in the foreground that was blown out by the strobe. Notice the vertical line all along the right edge, this represent pure white (pixel value 255). Probably an underexposed image. Notice that the data along the bottom does not reach all the way to the right edge. It could probably use a little more exposure, but it really depends on the photo. Like I mentioned before, many cameras can show 3 histograms at once, one for red, green and blue. 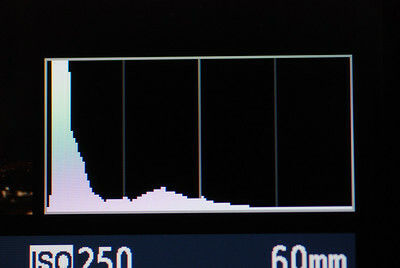 If I am having strobe problems, I will often check the red histogram. If the right side of the green and blue channels are strong, and there is almost nothing in the red channel, then most likely the strobe is not firing properly, or possibly is too weak or too far away from the subject.